Gratings that are subject to removal can be fastened with grating clips or saddle clips. In areas where welding or drilling is not permitted, Grating Clamps can provide the fastening solution. 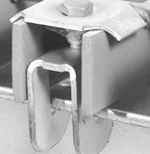 These bar grating anchoring clips install on the top surface of the grating and create a friction connection with the flange supporting the panel. The narrow spacing of close mesh aluminum gratings allows for countersinking of the bearing bars and fastening with flat head screws. We carry a full line of anchoring devices, including saddle clips, grating clamps, and Z clips. The other attachments methods are achieved during grating fabrication. Consult your Direct Metals' Sales Representative for the correct attachment method for your product and installation environment.